In this work, citric acid (CA) modified starch/gelatin composite films were prepared by mixing modified starch and gelatin in different proportions (1:0, 1:1, 1:4, 4:1 and 0:1). Blending of chemically modified starch with food grade CA and gelatin as second polymers were studied as a new and novel approach for fabrication of eco-friendly composite films with excellent packaging properties. Taking considerations of improvement in functional properties of the films, a series of starch films were derived using CA–starch and gelatin using solution casting approach. 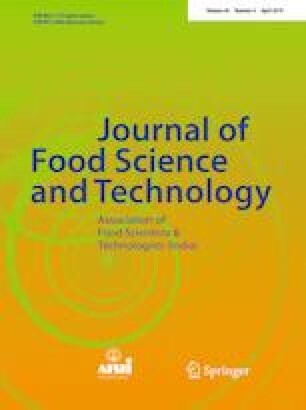 Influence of CA (0.5%, 1%, 3%, 5% and 7% w/w of total starch) on functional properties (moisture content, solubility, swelling index, moisture migration rate, moisture absorption, opacity and mechanical properties) were studied. FTIR and SEM analysis were utilized to characterize the interaction between the starch chains and surface morphology of films. Findings revealed that functional properties (aqueous solubility, swelling index, and moisture barrier properties) significantly (p < 0.05) improved as CA content increased. Composite films with CA–starch/gelatin of the ratio (4:1) revealed excellent functional properties. FTIR spectra illustrated strong interaction between the starch chains in the starch films. SEM analysis showed that gelatin exhibited good compatibility in the composite films. Therefore obtained composite films possessed a homogenious, dense and compact networks. In conclusion, CA and gelatin made better starch film properties and broadened the potential applications in the food packaging. R. Kumar is thankful to UGC, New Delhi for RGN fellowship. Authors are thankful to DST PURSE II and TEQIP-II for financial support.